Before entering the Halifax Public Gardens in Halifax, Nova Scotia, you will be greeted by a wrought iron fence with a unique sign decorating the gate. An oval shaped sign adorned with blue and white outer edges with people standing beside a white bird and a flower pot displayed over top. This sign marks the entranceway to the Halifax Public Gardens where natural beauty surrounds you while walking along the paths. Decorative sign on the wrought iron gate at the entrance to the Halifax Public Gardens along Spring Garden Road, downtown Halifax, Halifax Metro, Halifax Harbour, Nova Scotia, Canada. The Halifax Gardens were opened to the public in 1875. 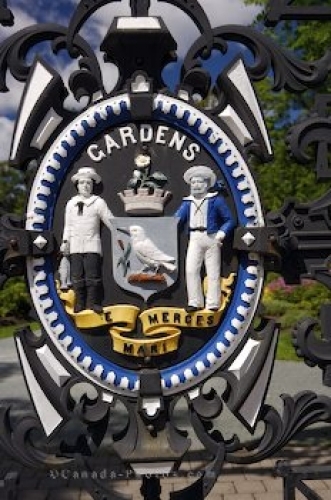 Picture of the sign on the wrought iron gate at the Halifax Public Gardens in Halifax, Nova Scotia.